I kind of ran out of cat pictures to put up every day to torture you until you start posting your own pix (OK I have a lot, but server storage is more precious than rubies), so instead I’ll show the label I sewed into your Moonbeam sweater. How a white ribbon turned pink I don’t know, but there’s no fix for color weirdness down here at my joint. Wishing you a swell weekend out on the end of the island. I’m ’bout out of steam on this whole summer vacation deal. School starts August 25, not that I’m counting the seventeen and one quarter days left or anything. You really make me laugh:) You will probably keep me alive for eons…or at least long enough to finish my stash (is that possible?). Ann, I`m not counting days too. School starts August 18 here. Envious? The labels are DIVINE. Where on god’s earth did you get them? Please don’t tell me you are so creative you made them yourself! Some schools in Arlington, VA, started last week, should you consider a move? Then you could come over and help me get over little needle phobia…. Kristine–It was a real Martha moment when I got out the embroidery hoop to do a label. I do them on anything I give as a present, and they’re uniformly lame in execution. But it’s fun at the end of a project to do something other than KNIT. Oh Jeez Ann, you do actually make those labels! I bow to your domesticity. I, alas, ordered some that say “Handknitted by Kristine”, but am too lame to even sewn them in most of the time! But after all, until I had to learn how to sew up my sweaters and such, I’d never sewn a darn thing. I aspire to your level of craftiness! The label is not only exquisite, but it will really up the ante on the Antiques Roadshow when Moonbeam appears 100 years or so from now. It gives it ‘Provenance’ with a capital P. No false modesty, now, Ann, the labels are great. 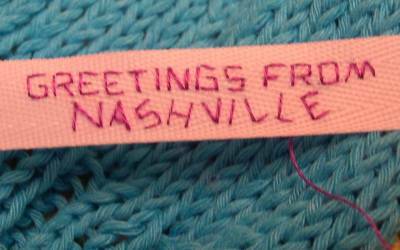 I’m stealing the idea because, all bragging aside, I think I can embroider a LOT worse than you. I have never wanted any of those labels you can order that say, ‘Hand Made With Love By Your Dear Old Aunt Kay’, or ‘A Mason-Dixon Knitting ORIGINAL! !’, because they are machine made and therefore offensive to my goofy folk art aesthetic. At the same time, I desperately craved some kind of label because of my high hopes for my great grandkids on Antiques Roadshow circa 2080. Why doesn’t anybody make any good ones?? I was thinking of writing something on a piece of seam binding with those fabric markers, but never got around to it.